This article was selected by The Caribbean Tourism Organization as the “Best Newspaper Feature of the Year" and "Best of Show"
MEADS BAY, Anguilla, British West Indies -- OK, there may have been a moment of panic as I steered the white rental car out of the parking lot. I have plenty of experience behind the wheel in countries whose British heritage compels them to drive on the left side of the road, and I've been fine. My basic rule of conversion: The driver is on the side of the vehicle nearest the center of the road. But my car's steering wheel was on the left side, which meant I was driving on the shoulder side. The problem: so was the person steering the car coming at us head-on. He was sitting where the passenger should be. For although Anguilla is British in tradition, cars from America are less expensive to buy and transport. But instead of a collision or even an angry horn, the driver simply pulled to his left and waved me by with a genial, understanding smile. On Anguilla, they do things differently. First, it's pronounced, "An gwill a," not "An gwee a,"although the name is derived from the French or Spanish word for eel. That's an apt description for this narrow, 16-mile-long, sand-fringed spit of limestone and sand that squirms its way along the Caribbean's northeast shoulder. Although Anguilla lies only a few miles north of the spine of old volcanoes that is St. Maarten, this most northerly of the Leeward Islands maintains a low profile, nowhere rising higher than 215 feet above the azure seas around it. Somewhat arid and not particularly fertile, scrubby with no forests or natural resources to exploit, the island was of no interest to early Spanish explorers. An English settlement was established in 1650, and despite being ravaged several times over the next three centuries by various calamities, the island remained a British colony, albeit one relatively low on the scale of importance. Ironically, because large plantations weren't practical, Anguilla never saw the mass importation of African slaves that populated bigger islands, and its residents eked out a subsistence fishing the abundant waters, harvesting salt or constructing colorful wooden boats. For much of the 20th century, the island's primary export was adult males, who sought work on other islands to supplement their families at home. Forty years ago, the island's total population had fallen to 4,000. All the island had was abundant sun, sand and sea, but those were to became valuable assets. In 1980, after a decade's struggle to establish some sovereignty over their own island, Anguillans took control of their destiny. While remaining a British overseas territory, islanders established rules on how its beachfront assets could be developed, with a strong emphasis on privately funded, locally involved projects. Since then, they have transformed their island from an obscure backwater of the British empire into an up-and-coming upscale vacation haven. Although British in tradition and politics, Anguilla uses the dollar and 90 percent of its visitors now come from North America. Much of the major tourism investment has been channeled in ways that provide both meaningful work for islanders and a revenue stream for the government to develop services and infrastructure while still maintaining control on development. The strategy seems to be creating a higher standard of living, and the population has increased to 12,000. Perhaps more remarkable, they've accomplished this without sacrificing their integrity, compromising their character or being overrun by mass tourism. No mainland jet planes land at Anguilla's tiny Wallblake Airport, but it does accommodate inter-island flights from San Juan, Puerto Rico; Antigua and St. Maarten, as well as several dozen Gulf Streams. 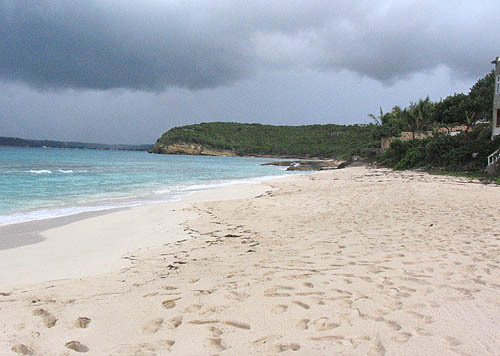 With no deep harbor, no big cruise ships call on Anguilla. The same goes for mega-yachts, which have no major marina. The island has no major tourist sites or archaeological ruins. Its national museum is in a restored cottage, and there's only a scattering of tiny art galleries. Anguilla's first golf course just opened last year. There are no casinos, shopping malls, fast-food outlets, brand-name chain resorts or big hotels. In fact, the largest hotel or resort on the island has fewer than 100 rooms. And it's all decidedly low-rise; the island has hardly any elevators. What Anguilla does offer in abundance, in addition to many miles of beautiful sand beaches fronting open azure oceans and a breezy subtropical climate year round, is a casual Caribbean kind of exclusivity. The island boasts a surprisingly abundant crop of excellent, often home-grown dining opportunities along with a proliferation of unique hotels, resorts, inns, villas, condos and other accommodation options that range from the impossibly palatial to the merely superb. While it has no Ritz-Carlton, Orient Express or other familiar upscale brand, Anguilla is home to three properties that rank among the Leading Small Hotels of the World. By comparison, there are only 20 members in the entire United States. In the past two decades, Anguilla has sprouted an impressive crop of dazzlingly white and angular mega-villas where the world's rich and celebrated come to sun. Wild chickens and goats roam free around the island, but paparazzi are rare. Island residents and illustrious visitors party in funky beachside cantinas, and everyone goes home happy. The island's main performance venue is an outdoor reggae beach bar created by Bankie Banx, a Caribbean legend once described as a cross between Bob Dylan and Bob Marley. 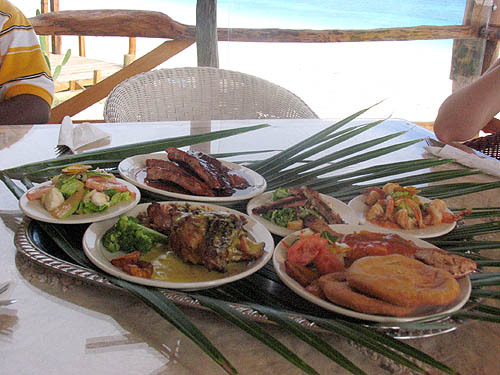 Lunch treats served at the Dune Preserve on Rendezvous Bay, a colorful beachside music venue owned by Anguilla reggae icon Bankie Banx. For those adventurous, there's plenty of snorkeling and scuba, with interesting wrecks on the island's various shoals and reefs, as well as salt-water fishing and wind-surfing. Birding and biking are also common pastimes. Anguilla is nothing if not laid back. Other than figuring out which side of the road to drive on, navigating the island proved a breeze. There's only one settlement that really counts as a town and only one main road, which traces the ridge along the island's western end and makes a loop around its wider eastern end. Almost every other lane that leads off this two-lane asphalt ribbon meanders down through scrubby expanses to a magnificent beach, often fronted with a stunning string of architectural pearls. In fact, the island's 35 square miles are fringed by 33 named beaches, several more than a mile long. We visited a dozen of them in our five days, and although all were open to the public, only one would be classified as anything but deserted. Even that one qualified as barely busy. It's easy to get the illusion that you have all that beautiful sand to yourself. • When to go: Although Anguilla's climate averages a temperate 80 degrees and flowers bloom 12 months a year, there are definite seasons when it comes to visitors. The busiest times are mid-December through March. That's especially true during the year-end holidays, when accommodations are at their most expensive. From grand villas to hotels, condos and home, rates can be half as much from April through September as they are during winter. Some properties close entirely for refurbishment during September and October. • Getting there: There are no commercial flights directly from North America to Anguilla's Wallblake Airport, but it does serve scheduled inter-island flights, charters and private jets. Most people fly American, JetBlue or US Airways to San Juan or St. Maarten, and make connections from there. 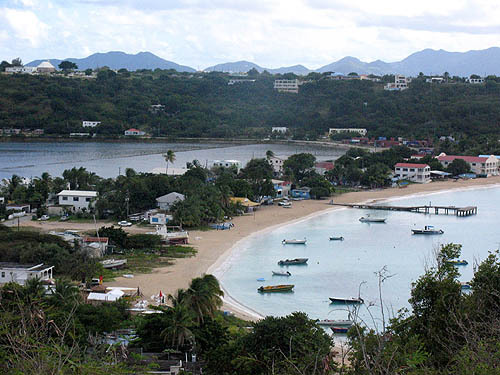 • Tip: Anguilla's a 10-minute flight from St. Maarten, but connections can be inconveniently timed. If you find yourself facing a long layover, consider taking a ferry instead. Funtime fast ferry shuttles depart directly from the pier at Princess Juliana airport in Saint Maarten daily at 2, 4 and 5:30 p.m. and take 40 minutes to the small port of Blowing Hole on Anguilla. Cost is $70 round trip and boats can also be chartered in advance. The public ferry departs every half hour between 7:30 a.m. and 7 p.m. from the pier in Marigot, on the French side of the island, which is a 20-minute cab ride from the airport. Public ferries take about 20 minutes and cost $12 each way, plus a $3 departure tax. • Late note: On Easter weekend (March 22-24), Anguilla will hold its first "Festival Del Mar," a community-based event in Island Harbor, the island's primary fishing village. Fishermen and chefs representing the island's full culinary spectrum, from five-star restaurant to beach barbecue pit, will come together to provide visitors and locals with samplings of the island's seafood creations. For details www.anguilla-vacation.com. 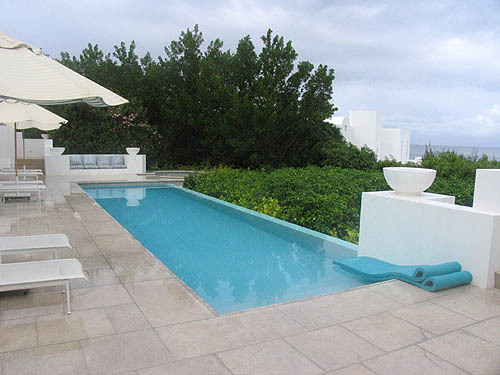 The Anguilla Hotel and Tourism Association (www.anguilla-vacation.com) offers a full listing of all island accommodations, but here's are some properties of particular note. Malliouhana Hotel and Spa -- Anguilla's first luxury resort set on a bluff between Meads Bay and Long Bay. All 88 of its spacious, high-ceilinged suites and guest rooms have a full ocean view. Conde Nast Traveler just named its restaurant, run by chef Michael Rostang, as the best hotel for food in the Caribbean. Its new full service spa is one of the largest in the Caribbean. Depending on season, nightly rates range from $375 to $770. www.malliouhana.com. Sheriva -- Three brand new four-, five- and six-suite, Caribbean-chic villas situated on 10 acres overlooking Cove Bay offer superb views of Saint Maarten in the distance. Suite rates run from $625 per night in summer to $945 in winter: www.sheriva.com. Blanchard's -- This elegant beachside restaurant features fine dining with Oriental influences and a superb wine list. www.blanchardsrestaurant.com. Smokey's -- There's no sign on the road (or Web site), but knowledgeable locals can point the way to this funky but fine beach bar on Cove Bay.